Egypt Sports Minister El-Amry Farouk led the welcoming ceremony on Saturday night for the Volleyball junior women's team in the airport after they became champions of the 14th African Nations Junior Women Volleyball Championship. "I promise you special prizes for your great accomplishment winning the African golden medals," the minister told the delegation. 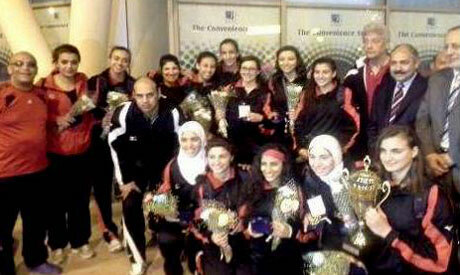 They defeated Algeria in the final 3-0 with results 25-22, 25-21 and 25-11. They even passed the hosts Nigeria 3-0 in earlier stages.